Check out the new pet of the week! Chowder is an English Spot Mix rabbit looking for her forever home. She has been homeless for over a month and is ready for some additional space to jump around. When you first meet Chowder, she comes off shy, but before you know it she opens up to be a total sweetheart and loves to be held. Win this girls heart with a handful of blueberries or carrots! 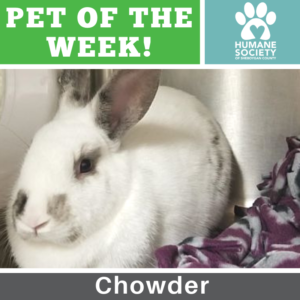 Find out more about Chowder here.